A beautiful painting always starts with a beautiful canvas – skincare is essential and what you put in your body is just as important as what you put on your body. I talk a LOT about feeding the skin from the inside out but not today. Instead I’m going to talk about feeding the skin from the outside in – and more specifically armpits. Deodorant is a product that is a “necessary evil”. On one hand you have exposure to cancer causing carcinogens and the other smelling like dirty socks after a short walk to your car on a hot summer day. We all know what we should choose, but that stick of antiperspirant is just so darn effective. 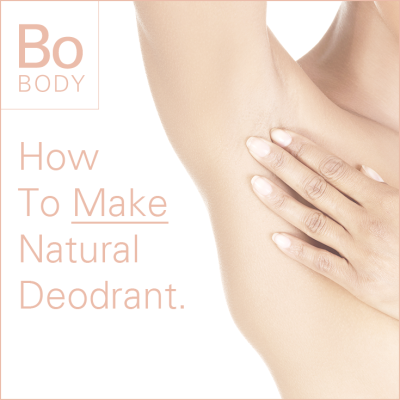 HOW TO MAKE YOUR OWN NATURAL DEODORANT – THAT ACTUALLY WORKS! This homemade all natural deodorant recipe is moisturizing and effective. You will still sweat but it will keep you fresh, clean and smelling like a field of lavender. Step 1. Add shea butter and coconut oil to a mason jar. Place the jar in a pot of boiling water until melted. Step 2. Add baking soda and arrowroot powder. Mix thoroughly until a thick paste forms. You may want to add more arrowroot powder for thickness, or more coconut oil for a creamier finish. Step 3. Mix in the essential oil and store at room temperature. For a more manly fragrance choose essential oils such as sandalwood or citrus, and for a fresher scent choose peppermint or tea tree, which are great because they’re a plant-based antibacterial that work with our bodies instead of against it – an added bonus. Ever made your own deodorant? How did it go? Head over to Facebook and share your experience with me! One Response to How To Make Natural Deodorant.